The LA Unified teachers union, UTLA, dropped its salary demand yesterday to an 8.5 percent increase from a 9 percent, the union’s third consecutive lowering of what many teachers consider the most important issue in negotiations for a new contract. As part of the change, UTLA negotiators also asked the district for an annual $1,000 stipend for all certificated bargaining unit members for supplies and support materials. And the union is demanding that members be paid at their hourly rate for professional development and or training. In the same bargaining session, the district addressed another key union issue — reducing class size — by saying with limited money available, the district would keep class sizes at their current levels and spend what it can on salaries. The two issues are among 12 the two sides are negotiating as the academic year moves into the second semester with no real agreement on salary — or much of anything else — in sight. The district’s most recent salary offer was a 4 percent raise, plus pay for professional development days that the district says represents another 2 percent. 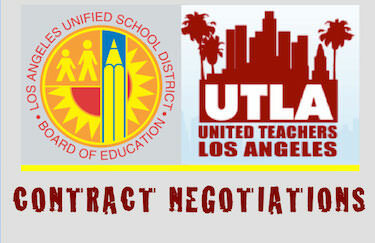 District negotiators did not change that offer yesterday. The union’s latest salary demand was its fourth, after starting at 17.6 percent over two years, then 10 percent for one year, then 9 percent for one year. Salary and class size are inextricably linked. More of one and smaller of the other have been two of the union’s bedrock demands since the election of Alex Caputo-Pearl as president last year. But the district has not budged from its position that, in effect, the union can’t have both, and for now, the priority is raising teacher pay. Data gathered by the district in October showed more than 1,500 middle school and high school classes enrolled 40 or more students throughout the district. More than 300 enrolled 50 or more students. Those figures exclude homeroom, physical education, choir, band and any unfilled sections, all of which tend to be larger in class size. Over the years UTLA agreed to several furlough days to maintain current class sizes but the district has phased those out using Proposition 30 revenues. In addition, the district used Local Control Funding Formula Funds to further reduce class sizes in secondary Math and English classes, below the levels protected by the furlough agreements. The two sides will meet for another negotiation session next week, on Jan 29.